2014 was a significant year where Dundas BI was launched. An overall visual identity for Dundas BI was needed, together with all necessary graphic elements for the communication campaign. Dundas Data Visualization is a leading, global provider of enterprise-ready Business Intelligence (BI) and Data Visualization solutions. 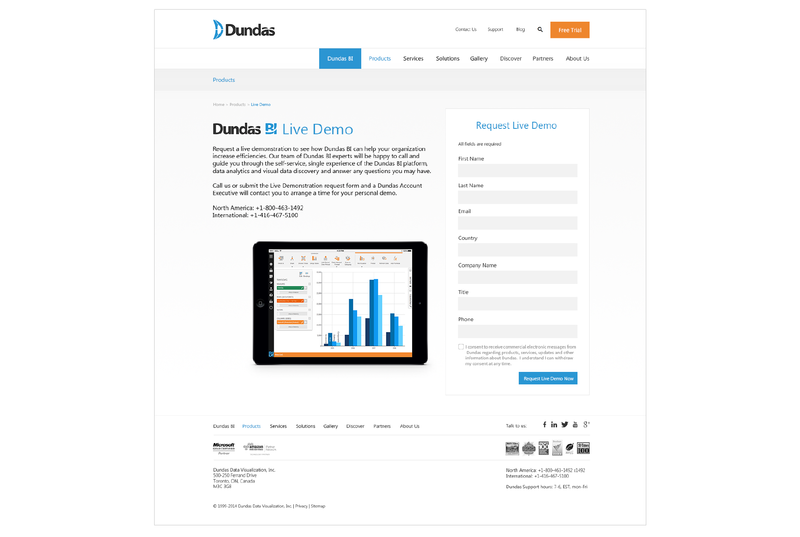 Dundas offers easy to use self-service, single BI experience allowing users to connect, interact and visualize powerful dashboards, reports and advanced data analytics for any data, on any device. Their flexible BI platform is fully supported by a consultative and best practice solutions approach. The project took place between June 2014 and November 2014. I worked actively in two different teams: Support and Marketing. The biggest challenge was to launch the new product in 5 months! We had a short timeline to execute with many, many changes. 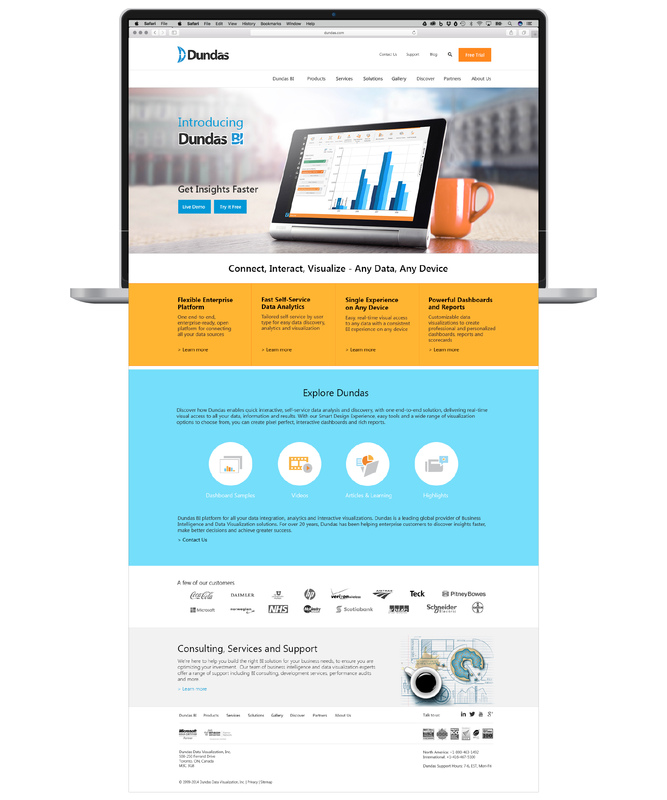 I led the redesign of the corporate website and I led design and creation of Dundas BI Support website for the new product. I also was responsible for creating brand identity and all accompanying marketing tools. It was crucial that the redesign effectively communicated the company’s updated identity, goals, and objectives. 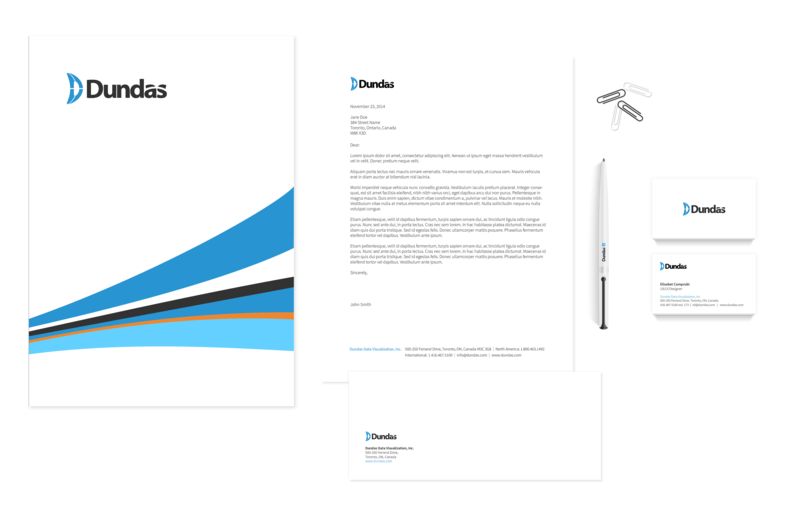 I created a new brand identity for Dundas BI and all the marketing tools were required for the product launch. Brand definition - We established the Company Values to communicate the new visuals of the company to our clients and created a new logo for Dundas BI and a new visual language. Concept development - A whole new style for the product launch was created. The incorporation of ribbons introduced Dundas BI after taking into consideration the values and attributes of the company: innovation, flexibility, movement and growth. 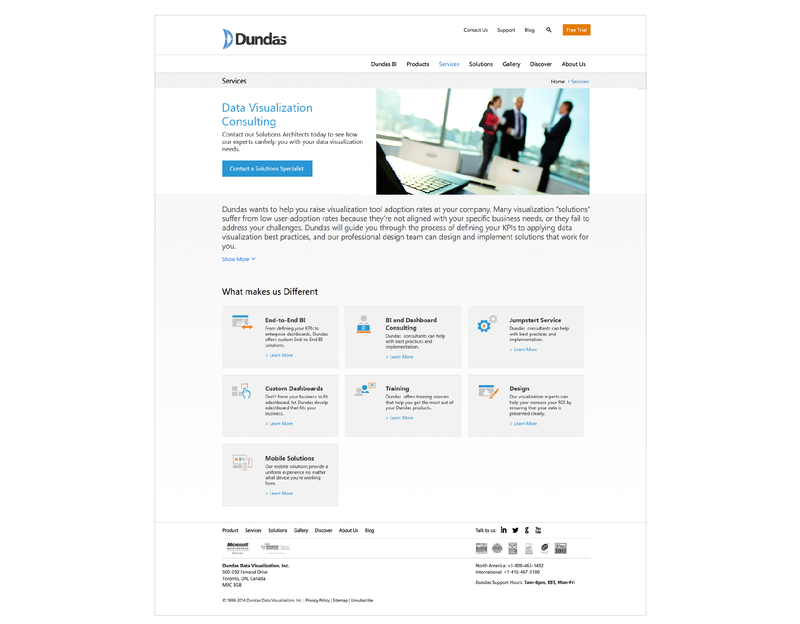 Presenting Dundas BI - As part of the launch of Dundas BI, the Dundas corporate website had to undergo a redesign. As we prepared for the launch of Dundas BI, it was going to be important for the introduction of and information about the new product to be properly integrated into the official website. We also needed to create a support site that would act as our customer service interface. After a well-coordinated and successful launch, the complete design refresh was met with outstanding reviews by company members, partners, and customers. We recruited new clients as well as retained many existing clients by successfully migrating them over to the new product. 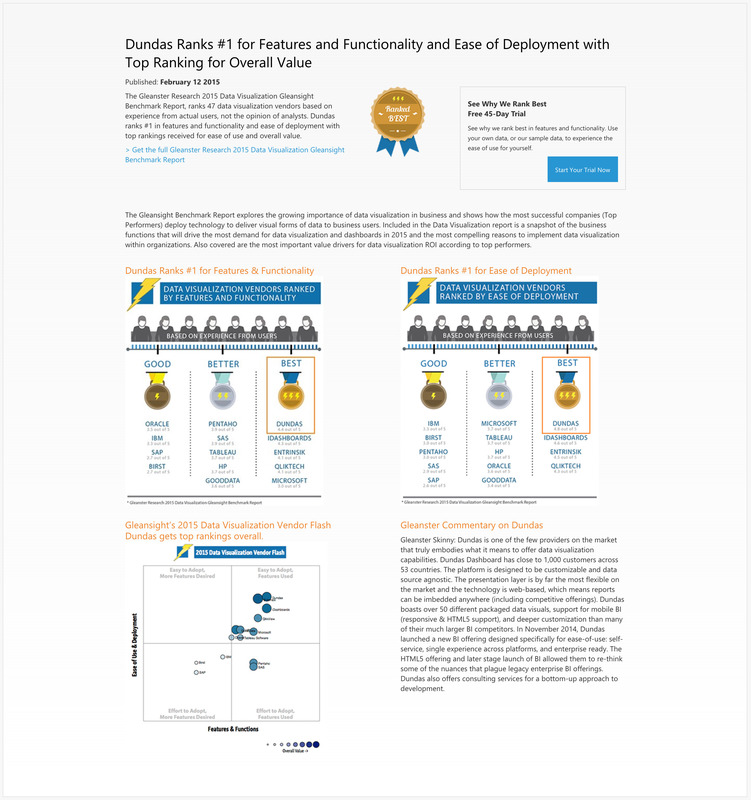 Dundas Ranked #1 in Features and Functionality and Ease of Deployment with Top Ranking for Overall Value. Read full Gleanster Research 2015 Data Visualization Gleansight Benchmark Report.